Many of the technologies we use every day have been getting smaller, faster and cheaper each year—with the notable exception of batteries. Apart from the possibility of a smartphone which could be fully charged in minutes, the challenges associated with making a better battery are holding back the widespread adoption of two major clean technologies: electric cars and grid-scale storage for solar power. "We're always looking for materials with high-rate battery performance, which would result in a much faster charge and could also deliver high power output," said Dr. Kent Griffith, a postdoctoral researcher in Cambridge's Department of Chemistry and the paper's first author. In the search for new electrode materials, researchers normally try to make the particles smaller. "The idea is that if you make the distance the lithium ions have to travel shorter, it should give you higher rate performance," said Griffith. 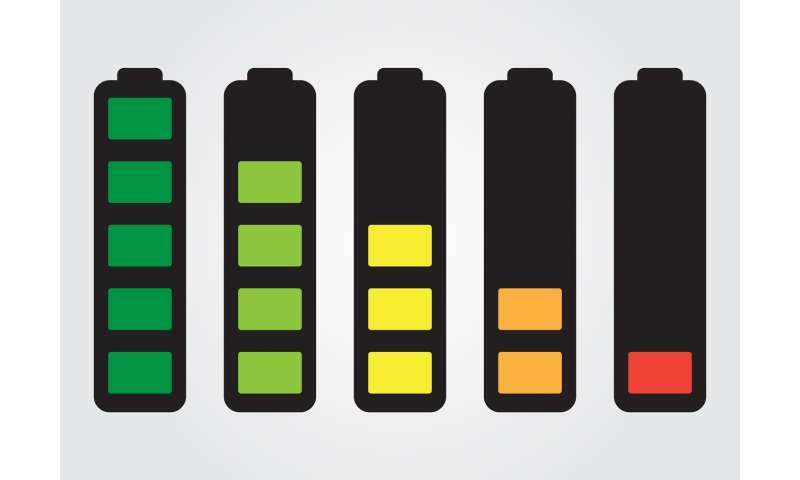 "But it's difficult to make a practical battery with nanoparticles: you get a lot more unwanted chemical reactions with the electrolyte, so the battery doesn't last as long, plus it's expensive to make." "Nanoparticles can be tricky to make, which is why we're searching for materials that inherently have the properties we're looking for even when they are used as comparatively large micron-sized particles. This means that you don't have to go through a complicated process to make them, which keeps costs low," said Professor Clare Grey, also from the Department of Chemistry and the paper's senior author. "Nanoparticles are also challenging to work with on a practical level, as they tend to be quite 'fluffy', so it's difficult to pack them tightly together, which is key for a battery's volumetric energy density." "Many battery materials are based on the same two or three crystal structures, but these niobium tungsten oxides are fundamentally different," said Griffith. The oxides are held open by 'pillars' of oxygen, which enables lithium ions to move through them in three dimensions. "The oxygen pillars, or shear planes, make these materials more rigid than other battery compounds, so that, plus their open structures means that more lithium ions can move through them, and far more quickly." "In high-rate applications, safety is a bigger concern than under any other operating circumstances," said Grey. "These materials, and potentially others like them, would definitely be worth looking at for fast-charging applications where you need a safer alternative to graphite." In addition to their high lithium transport rates, the niobium tungsten oxides are also simple to make. "A lot of the nanoparticle structures take multiple steps to synthesise, and you only end up with a tiny amount of material, so scalability is a real issue," said Griffith. "But these oxides are so easy to make, and don't require additional chemicals or solvents." While the oxides may only be suited for certain applications, Grey says that the important thing is to keep looking for new chemistries and new materials. "Fields stagnate if you don't keep looking for new compounds," she says. "These interesting materials give us a good insight into how we might design higher rate electrode materials."